Want to make a dang cute shirt like this? We got the basic pattern idea off of Make it and Love it, but we have added our own little twist to it and taken out and added some things. We made these shirts at the same time and took pictures of both of our fabric so sometimes you will see white fabric and other times you will see maroon fabric. A shirt that fits you just perfectly that you already own. Fold your shirt in half and place on the fold of the fabric. 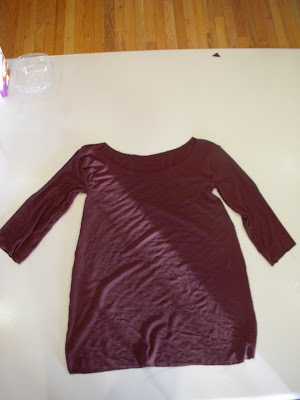 Cut out around shirt about an inch away leaving room for seam allowance. You will need to cut this out TWICE on a fold so don't cut in the middle of your fabric leaving no room. Don't cut out the sleeve just yet. Cut a curve instead. This is what the back piece of your shirt should look like. Now do it again to make your front piece. We wanted the front of our shirts to have more of a round neck instead of choking us, so we cut out a larger neck. Laid out flat, here are the two pieces we just cut out. A front piece and a back piece. Here is what one cut out sleeve looks like cut on the fold. 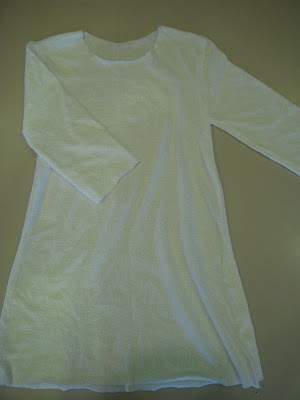 Here is what a sleeve looks like when it is laid out flat. 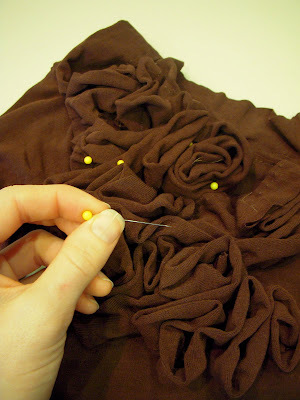 Put the sleeves aside for now and start pinning the body of your shirt RIGHT SIDES together. 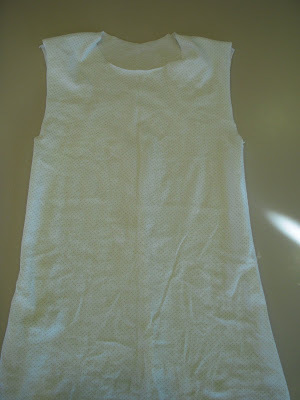 You will need to sew only the sides of the shirt (NOT THE SLEEVE HOLES) and the top of the shoulders. Pull your shirt right side out and take a good look at it. It should look like this. Now go and get your sleeves. Pin right sides together like this. No need to pin any further up the sleeve since you wont be sewing that part of it yet. Sew the sleeve together stopping at the curve. 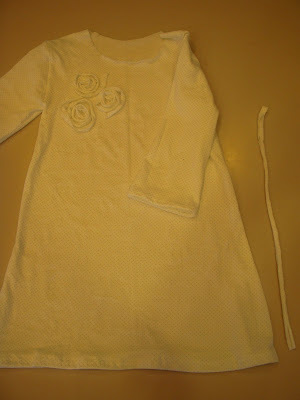 To attach the sleeve, line up the seam of the sleeve with the seam of the shirt, right sides together. Pin the sleeve up to the shoulder and all the way around right sides together. Sew away! When you have got both sleeves on, pull your shirt right side out and take a look at your craftiness. Now you need to start hemming. Pin up the raw edges and hem away! Do this to the bottom of the shirt and the end of the sleeves. 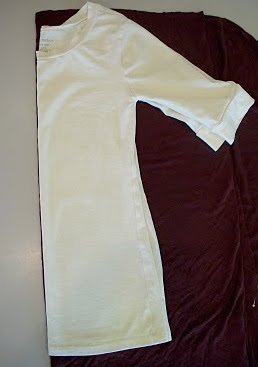 Here is your hemmed shirt with sleeves. Now to embellish. You really can do a number of things. I took about four long strips of fabric here and just went at it. I just scrunched up the fabric and worked with it until I liked how it looked. Then I pinned the strips in place so I could easily hand sew the design I desired in place. Cut 3 long strips from your extra fabric. About a foot and a half long. In the end, your shirt will look like this. For this shirt I did not make a neck. I just left it raw because that was the look I was going for. or your shirt will look like this.... I added a strip of fabric here to add a little texture around the neck. Have fun! Let us know how your dang cute shirt turns out! I was blog hopping and found your site! I love your ideas, especially this shirt one. I think I will make my own shirt tonight, and maybe even some for my girls. Thank you for sharing your re-purposing and handmade ideas. Do you have any ideas for distressing and revamping picture frames or old wood furniture? I am on the hunt for that.